A day of July 1996 whereas I stopped in a small village in Madagascar; one presented samples of a strange stone to me. At first sight its color could reminds certain zircon, but I quickly identified it as garnet. After some palaver, one led me to the place of the discovery. I must acknowledge that I already knew the inhabitants with whom we tied friendship the previous year. On the spot, a notch of about one meter fifty in a white color rock had created a not very impressive hole. But, according to its authors, it was particularly painful to produce it with iron bars only. I readily believed them after to be approached to the rock. Some particles of this stone to the orange - pink-brown reflections remained taken in the bedrock. I encouraged my friends to be still sought. pink-orange for others is due to chromium and vanadium traces. Other samples were orange-yellow and did not change color under the various sources of lighting. from it, and the occurrence was abandoned a few weeks after its discovery. samples more or less similar to those which I made cut in 1996 were found. They were turbid because of the fine rain of small inclusions they contained. 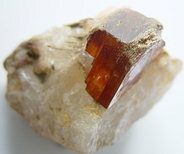 Their color was definitely more orange than malaya garnets from the first occurrence. Indeed, they did not come from the same place. This is a little more than one kilometer of distance that the elluvionnar deposit was discovered. At this time orange garnet fever was launched. 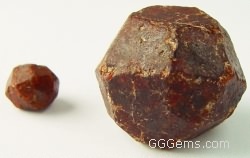 growth of the precious malaya garnet. the world to deliver this type of Malaya garnet. in its gangue. Of transparent quality, it shows a similar color to that of malaya garnets.
" Personal Collection A. Darbellay "
Here, typical rough material found at that time. Its original shape has been altered. quartzites, metamorphic marbles, some micaschists. Plagioclase are playing a very subordinate role. orthoclase ( leptynites ), biotite, and garnet. Old granites are extremely rare and transformed into orthogneiss. ortholeptynites that easily separate from abundant paraleptynites rich in garnet. Graphitic leptynites are fully leucocratic rocks without aluminous minerals, at kaolinized feldspars. stratification in some place. In this case it derived markedly of leucocratic granites and pegmatites. 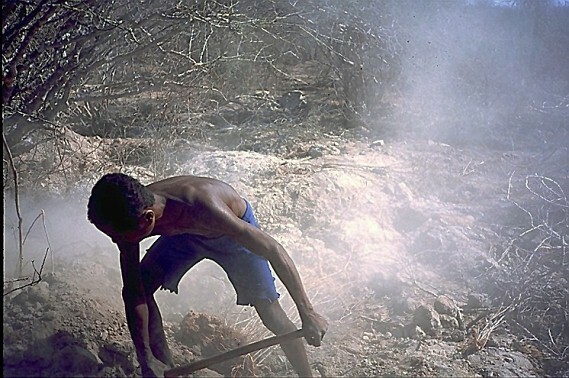 The mineralization comprises graphite, garnet, manganese, and gold. shape, at the time of the discovery in 1998.
sometimes important, in crystalline schists. West and Androyen in the East. harmony with the rich in alumina-anorthosito hyperitic complex. 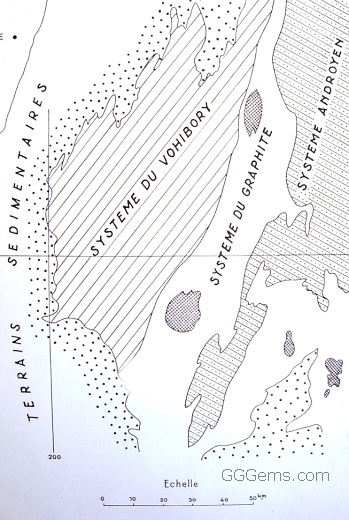 Géological References: A. Lacroix, J.Giraud, M. Raoult, H.Bessairies. © 1987 - 2018 GGGems.com, All Rights Reserved.